In a recent commission for a Vendel helmet without pressblech panels, I relied on line-drawings in Dominic Tweddle's Anglian Helmet from Coppergate to recreate how the underlying structure of the original Valsgärde VIII helmet might have looked without its shell of decorated foils. I blackened the exposed steel with several coats of baked-on linseed oil. 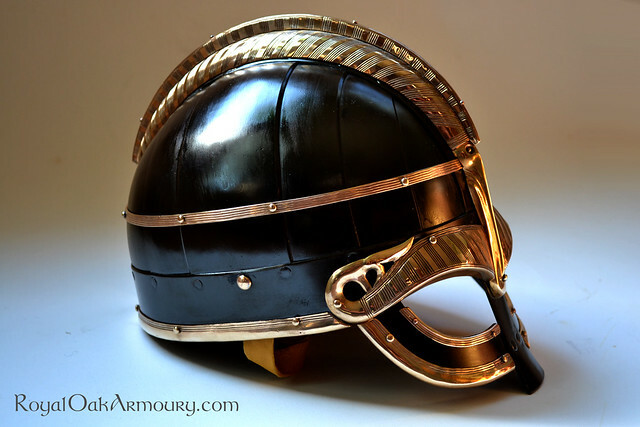 An extrapolative quilted linen arming cap was made to accompany the helmet, as was a shield boss in matching blackened steel with large brass-capped nails and button. The boss was based on a comparatively modest find from Vendel XIV, re-proportioned to accommodate a larger hand. There are more images of the project posted to my Facebook page in the Vendel, Viking and Early Medieval album. Thanks for looking! well I'm pretty well lost for words. Amazing stuff Jeff, everything comes together beautifully. Really beautiful work and I really like the intensity of that blackened finish. Just curious but how durable is the baked on linseed oil ? Is it more scratch resistant than blueing and can it be touched up in some way should it get a scratch ..... haven forbid considering how nice it is, but in period a using helm would get some wear from use. Does the baked on linseed oil turn into an enamel hard surface ? Can it be done and built up using many coats and spot heating with a propane torch, or does it bake in some sort of oven/furnace ? I guess one needs to get the steel hot enough but not too hot ? Don't want you to give away trade secrets unless you feel comfortable doing it. As a coincidence I took a picture of the original one (and some of the others) last saturday when I visited Historiska in Stockholm. It is a bit hard to tell by the photo, but my impression from seeing it is that its basic construction is a raised single piece, with the copper alloy strips for the pressblechs riveted on afterwards. Gorgeous work on the repro in any case, the gold/lineseed oil finish work really well together. If I could only have one helmet repro ever, it would be one of the Valsgärde helmets. Beautiful helm Jeff. Love the blue/black finish, combined with the brass work. Just wondering, is there any period evidence for this kind of finish, or is it a bit of artistic license? Thanks for the positive feedback, all. To answer several questions at once, a blackened linseed oil finish on a Vendel helmet is, as far as I know, a modern convention. 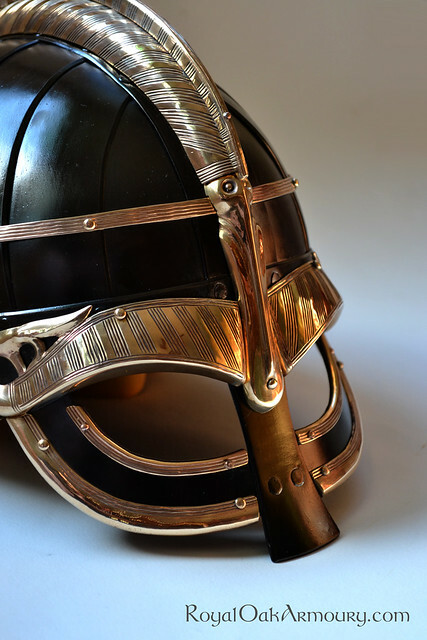 It happens to be an excellent, durable rust inhibitor and provides a pleasant tonal contrast for the brass trim, but the majority of the surface area on most original Vendel helmets was covered in pressblech decoration, and what to do with a large surface of exposed steel is a problem that arises when an armourer is asked to make a stripped-down version of such a helmet. When put in the situation, I thought exposing the sub-structure of the helmet to be a visually interesting and informative option - particularly considering that the superficial impression of the pressblech-covered original is, misleadingly, of a smooth mono-plate helmet underneath. As to whether linseed oil blackening was used on the original Vendel helmets, I do not know. If anything has been published that sheds light on this, I would be happy to be directed to it but one of the members whose scholarly interests delve deeper into this culture. Jean, to answer you more fully: to apply a linseed oil finish to a helmet, I first wipe it clean with ethanol. Then I cover the helmet in an even, thin coat of oil with a lint-free cloth, and place it on several layers of aluminum foil on a barbecue grill. Slow heating of the oil allows it first to harden, then to colour. Excessive heat causes the oil surface to craze and wrinkle before colouring. 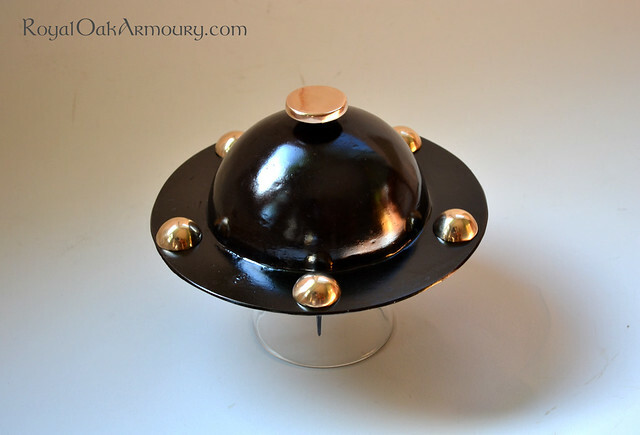 I allow the first coat to come to a dark brown colour, and then cool the helmet. Subsequent layers are added in the same fashion, but it is only with the final layer that I allow the heat to rise high enough to fully blacken the piece. The reason being that, if the piece were already fully black, it would be difficult to judge when the subsequent layers had blackened, and they could be under baked, or worse - they could decompose, leaving a bare steel surface. The surface is tough, and more resilient than most paints. Touch-ups are possible but seldom convenient, because of painted inner surfaces and leather straps. Unless a scratch has gone through all of the layers of baked-on oil to the metal surface, the marring can be brought back to the same colour as the rest of the piece with the addition of another layer of linseed oil, which is allowed to harden but is not blackened. The resulting surface is not hard like enamel, but such brittleness would be undesirable anyway. Thanks for the compliments and questions. 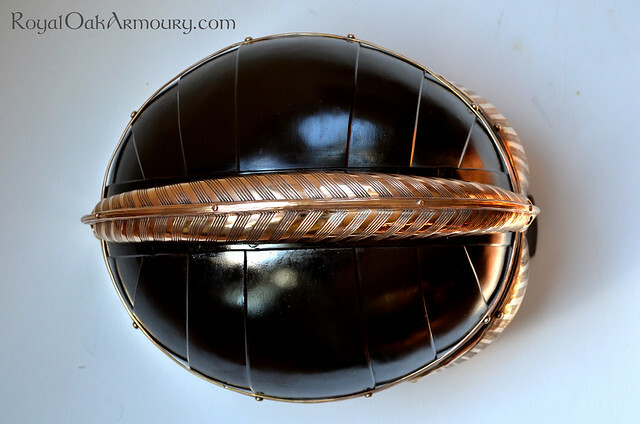 the contrast of black and bronze, it may as well be a crown. I've never heard of using linseed oil to blacken, by the sounds of it, seems tricky.